it is very rare that I review other developer’s apps; and usually only if they make use of one of my components. But for the iOS Developer Challenge I am making an exception. This app is quite unique as it is a fun mixture of being an iOS development game and education app. iOS Developer Challenge is a universal app, available on the app store for two dollars. 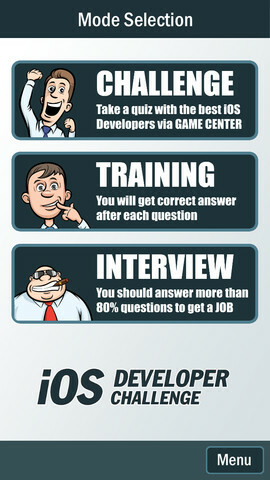 It is targeted squarely at iOS developers and those who want to become pros some day. It has tons of questions, formulated in a way how you might be asked in a job interview. The app has a large number of questions in all the relevant areas related to iOS development. This is the result I got on my first challenge. 1 incorrect answer out of 21. So close to perfect victory. Damn, I need to go again! Navigation throughout the app is straightforward and it has many neat graphics that give it a decent amount of liveliness. For such a low price I think it is an insta-buy for all iOS developers. If anything then this app can enlighten you as to which areas of the whole iOS development story you are lacking in. 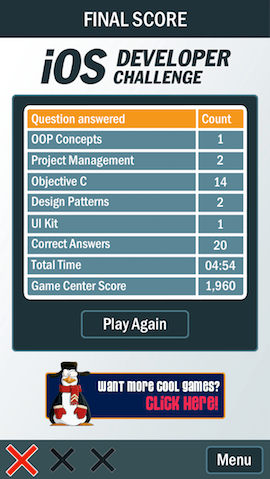 What’s also fun is to see the test integrated with game center for the leaderboard as well as achievements. This, coupled with the ability to challenge your colleagues. At the time of this writing there were only 63 players in total on this app’s leaderboard. There are clearly there are more developers with iOS devices out there than this, so the only reason why there are so few players is that until today you probably didn’t know about this game. You should get it today. Dear iOS Developers community! If you like the “Developer Challenge” app, please write a review in Appstore and leave a star rating. It will help me a lot. I like programming but app marketing is a pain. 47/50 in the “Job interview” mode – “You failed”. Really?!! What about >80%?